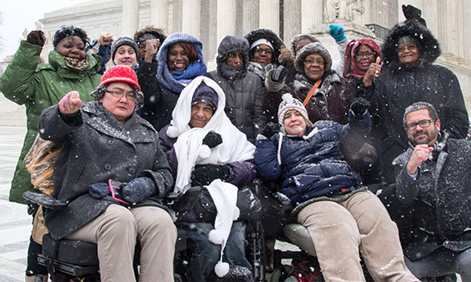 The US Supreme Court has ruled that home health care workers are not the employees who can be required to pay a “fair share fee” when a majority of their coworkers vote for union representation, reports the Washington Post. The decision in Harris v. Quinn, which saw the court’s 5 conservatives line up against its 4 liberals, affects only that group of workers, but it also “chips away at the collective bargaining power of unions,” writes the Guardian, stopping “short of the nuclear option” of outlawing fair share fees for all workers. The case was backed by the anti-union National Right to Work Committee. SEIU, which represents the workers who will lose protections, said the ruling places affordable home health care at risk. A second Supreme Court’s decision last week over President Obama’s ability to make recess appointments was directly about members he named to the National Labor Relations Board in 2012. The court did not rule against the president’s ability to make appointments when the Senate was in recess, only that the Senate was not properly in recess. The decision may have limited impact, according to one union law blog. Meanwhile, the UC system last week reversed its 1989 policy prohibiting the university from making "direct financial investments" in "companies or services that UC has supported," reports the Sacramento Business Journal. President Napolitano also "announced a new startup pilot program" and the creation of a council, to include "venture capitalists and business executives," who will meet "in August to hammer out a technology commercialization strategy." According to a state audit of sexual violence training at four California public universities, not all staff "who handle complaints of sexual harassment and assault receive adequate training," reported the Sacramento Bee. The institutions are UC Berkeley, UCLA, Cal State Chico and San Diego State. The auditor also recommended that the four universities examined "do more to appropriately educate students" about these issues. UC Berkeley chancellor Nicholas Dirks responded on SF Gate. Last week the university first advised staff "to avoid using peer-to-peer services, such as Airbnb, Uber and Lyft, during university-related business in light of concerns that [they] are not adequately regulated," reported the Daily Californian, then "clarified" two days later (after press reports) that it "allows and reimburses" their use "but is 'actively seeking ways to overcome potential liability and safety concerns.'" The Affordable Care Act favors the use of employee wellness programs, but the California Employment Lawyers Association blog cautions that wellness programs may lead to invasions of employee privacy and discrimination.